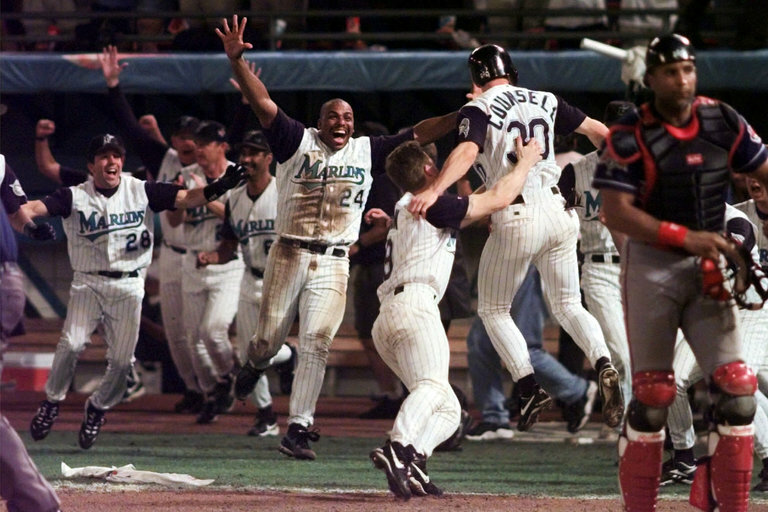 Florida Marlins’ Craig Counsell was greeted by teammates, after he scored the winning run on an Edgar Renteria hit in Game 7 of the 1997 World Series. CLEVELAND — The Cleveland Indians remain one victory from winning their first World Series in 68 years. But in an alternate universe, the Indians’ wait for another championship is not nearly that long. At the time, I was working for another New York newspaper and typed out that sentence in the bottom of the ninth inning of Game 7 of the World Series, in Miami, with the Indians about to vanquish the Florida Marlins and become baseball’s champions. Decline fears: Can Joey Votto, Robinson Cano fight off the aging curve?